Abbildung 2: Räumliche Struktur von R-Alpha-Liponsäure und S-Alpha-Liponsäure. Mukoviszidose: In einem Tiermodell für Mukoviszidose (Zystische Fibrose) hemmte Alpha-Liponsäure die Entzündung der Luftwege. Die empfohlene therapeutische Dosierung (R/S)-Alpha-Liponsäure beträgt 600- 1800 mg pro Tag. Die natürliche R-Form der Alpha-Liponsäure ist wahrscheinlich in geringeren Dosierungen wirksam. (2) Als Erhaltungsdosis für Personen ohne ernsthafte gesundheitliche Beschwerden können ca. 100 mg pro Tag beibehalten werden. Die Resorption von Alpha-Liponsäure ist vermutlich besser, wenn das Nahrungsergänzungsmittel unabhängig von einer Mahlzeit eingenommen wird (30 Minuten vor dem Essen oder 2 Stunden nach dem Essen). (3) Da Alpha-Liponsäure und Vitamin E bei oxidativem Stress synergistisch wirken, sollte erwogen werden, neben Alpha- Liponsäure auch Vitamin E ergänzend einzunehmen. (71) Die Kombination von Alpha-Liponsäure und Vitamin E hat eine Blutverdünnende Wirkung, was bei einer erhöhten Gerinnungsneigung günstig ist. Shay KP et al. Alpha-lipoic acid as a dietary supplement: Molecular mechanisms and therapeutic potential. Biochimica et Biophysica Acta 2009;1790:1149-1160. Alpha-lipoic acid. Monograph. Altern Med Rev. 2006;11(3):232-237. Goraca A et al. Lipoic acid &#x2014; biological activity and therapeutic potential. Parmacological Reports 2011;63:849-858. Matsugo S et al. Elucidation of antioxidant activity of alfa-lipoic acid toward hydroxyl radical. Biochem Biophys Res Commun. 1995;208:161- 167. Packer L et al. Alfa&#x2014;lipoic acid as a biological antioxidant. Free Radic Biol Med. 1995;19:227-250. Perricone N et al. Alpha lipoic acid protects proteins against hydroxyl free radical-induced alterations: rationale for its geriatric topical applications. Arch Geriontol Geriatr. 1999;29(1):45- 56. Petersen Shay K et al. Is alpha lipoic acid a scavenger of reactive oxygen species in vivo? Evidence for its initiation of stress signalling pathways that promote endogenous antioxidant capacity. IUBMB Life. 2008;60(6):362-7. Packer L et al: Neuroprotection by the metabolic antioxidant alfa-lipoic acid. Free Radic Biol Med 1997;22(1-2):359-378. Foo NP. alpha-Lipoic acid inhibits liver fibrosis through the attenuation of ROS-triggered signaling in hepatic stellate cells activated by PDGF and TGF-beta. Toxicology. 2011;282:39-46. Kolesnichenko LS et al: The blood glutathione system in cerebral vascular diseases and its treatment with alpha-lipic acid. Zh Nevrol Psikhiatr Im S S Korsavoka, 2008;108(9):36-40. 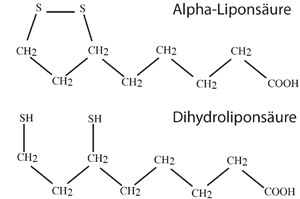 Kagan VE, Shvedova A, Serbinova E et al: Dihydrolipoic acid&#x2014;a universal antioxidant both in the membrane and in the aqueous phase. Reduction of peroxyl, ascorbyl, and chromanoxyl radicals. Biochem Pharmacol. 1992;44:1637- 1649. Podda M, Tritschler HJ, Ulrich H et al: Alfa-lipoic acid supplementation prevents symptoms of vitamin E deficiency. Biochem Biophys Res Commun. 1994;204:98-104. Jacob S et al. Oral administration of RACalfa- lipoic acid modulates insulin sensitivity in patients with type-2 diabetes mellitus: a placebo-controlled pilot trial. Free Radic Biol Med. 1999;27(3-4):309&#x2014;314. Carlson DA et al. The plasma pharmacokinetics of R-(+)-lipoic acid administered as sodium R- (+)-lipoate to healthy human subjects. Altern Med Rev. 2007;12:343-351. Opdam FL et al. Paddestoelen liggen zwaar op de lever. Klinische casus: intoxicatie met Amanita. Pharmaceutisch Weekblad 2003;138(21):739- 745. Huerta-Olvera SG et al. Alpha-lipoic acid regulates heme oxygenase gene expression and nuclear Nrf2 activation as a mechanism of protection against arsenic exposure in HepG2 cells. Environ Toxicol Pharmacol. 2010;29(2):144-149. Min AK et al. Alpha-lipoic acid inhibits hepatic PAI-1 expression and fibrosis by inhibiting the TGF- beta signaling pathway. Biochem Biophys Res Commun. 2010;393(3):536-541. Poh ZA et al. A current update on the use of alpha lipoic acid in the management of type 2 diabetes mellitus. Endocr Metab Immune Disord Drug Targets. 2009;9(4):392-8. Navarese EP et al. Effect of alpha lipoic acid on cardiac autonomic dysfunction and platelet reactivity in type 1 diabetes: rationale and design of the AUTOnomic function and platelet REACTivity trial (AUTO-REACT protocol). Diabetes Res Clin Pract. 2011;92(3):375-9. Midaoui AE et al. Prevention of hypertension, insulin resistance, and oxidative stress by alpha-lipoic acid. Hypertension. 2002;39:303-307. Koh EH et al. Effects of alpha-lipoic acid on body weight in obese subjects. Am J Med. 2011;124:85e1-85e8. Jacob S et al. Enhancement of glucose disposal in patients with type 2 diabetes by alfa&#x2014;lipoic acid. Arzneimittelforschung. 1995;45:872-874. Kawabata T et al. 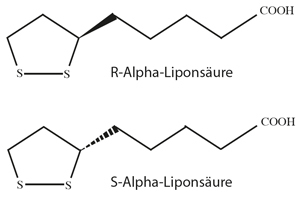 Alfa-lipoate can protect against glycation of serum albumin, but not low density lipoprotein. Biochem Biophys Res Commun. 1994;203:99-104. Nagamatsu M et al: Lipoic acid improves nerve blood flow, reduces oxidative stress, and improves distal nerve conduction in experimental diabetic neuropathy. Diabetes Care. 1995;18:1160-1167. Suzuki YJ et al. Lipoate prevents glucoseinduced protein modifications. Free Radic Res Commun. 1992;17:211-217. Singh U et al. Alpha-lipoic acid supplementation and diabetes. Nutr Rev. 2008;66(11):646-57. Ziegler D et al. Treatment of symptomatic diabetic peripheral neuropathy with the antioxidant alfa-lipoic acid. A 3-week multicentre randomized controlled trial (ALADIN Study). Diabetologia. 1995;38:1425-1433. Ziegler D et al. Alfa-lipoic acid in the treatment of diabetic peripheral and cardiac autonomic neuropathy. Diabetes. 1997;46(suppl 2):S62&#x2014; S66. Ziegler D et al. The ALADIN III Study Group. Treatment of symptomatic diabetic polyneuropathy with the antioxidant alfa-lipoic acid: a 7-month multicenter randomized controlled trial (ALADIN III Study). Diabetes Care. 1999;22:1296&#x2014;1301. Kojima M et al. Effect of alpha-lipoic acid against diabetic cataract in rats. Jpn J Opthalmol. 2007;51(1):10-3. Filina AA et al. Lipoic acid as a means of metabolic therapy of open-angle glaucoma. Vestn Oftalmol. 1995;111:6-8. Lin J et al. Effect of R-(+)-alpha-lipoic acid on experimental diabetic retinopathy. Diabetologia. 2006;49(5):1089-96. Melhem MF et al. Effects of dietary supplementation of alpha-lipoic acid on early glomerular injury in diabetes mellitus. J Am Soc Nephrol. 2001;12:124-133. Yi X et al. alpha-Lipoic acid protects diabetic apolipoprotein E-deficient mice from nephropathy. J Diabetes Complications. 2011;25(3):193-201. Bharat S et al: Pre-teatment with R-lipoic acid alleviates the effects of GDH depletion in PC12 cells: implications for Parkinson’s disease therapy. Neurotoxicology 2002;23(4-5):479-86. Lovell MA et al. Protection against amyloid beta peptide and iron/hydrogen peroxide toxicity by alpha lipoic acid. J. Alzheimer Dis. 2003;5(3):229-39. Frank B et al. A review of antioxidants and Alzheimer disease. Ann Clin Psychiatry. 2005;17(4):269-86. Hager K et al. Alpha-lipoic acid as a new treatment option for Alzheimer’s disease &#x2014; a 48 months follow-up analysis. J Neural Transm Suppl. 2007;(72):189-93. Maczurek A et al. Lipoic acid as an antiinflammatory and neuroprotective treatment for Alzheimer’s disease. Adv Drug Deliv Rev. 2008;60(13-14):1463-70. Packer L et al. Neuroprotection by the metabolic antioxidant alpha-lipoic acid. Free Radic Biol Med. 1997;22(1-2):359-78. Packer L. Alfa-Lipoic acid: A metabolic antioxidant which regulates NF-kappa B signal transduction and protects against oxidative injury. Drug Metab Rev. 1998;30(2):245-275. Liu J. The effects and mechanisms of mitochondrial nutrient alpha-lipoic acid on improving age-associated mitochondrial and cognitive dysfunction: an overview. Neurochem Res. 2008;33(1):194-203. Seybolt EJ. Is it time to reassess alpha lipoic acid and niacinamide therapy in schizophrenia? Medical Hypotheses 2010;75:572-575. El-Beshbishy HA et al. Abrogation of cisplatininduced nephrotoxicity in mice by alpha lipoic acid through ameliorating oxidative stress and enhancing gene expression of antioxidant enzymes. Eur J Pharmacol. 2011;668:278-284. Shirotake S et al. Antioxidant, alpha-lipoic acid, ameliorates renal injury of unilateral ureteral obstruction (UUO) in rats. J Urol. 2008;179(4 Suppl):86. Bae EH et al. Effects of alpha-lipoic acid on ischemiareperfusion- induced renal dysfunction in rats. Am J Physiol Renal Physiol 2008;294:F272&#x2014;F280. Amudha G et al. Therapeutic efficacy of DL- alpha-lipoic acid on cyclosporine A induced renal alterations. Eur J Pharmacol 2007;571:209-214. Khabbazi T et al. Effects of alpha-lipoic acid supplementation on inflammation, oxidative stress, and serum lipid profile levels in patients with end-stage renal disease on hemodialysis. J Ren Nutr. 2011 Sep 10. Pastuszka A et al. Alpha-lipoic acid may be a clinically useful therapy in interstitial cystitis. Med Hypotheses. 2007;69(4):957-8. Yýldýrým A et al. S50 The effect of alpha lipoic acid and silymarine on bladder o utlet obstruction. Eur Urol Suppl. 2011;10(9):I-X. Sumathi R et al. Impaired lipid metabolism in calcium oxalate stone forming rats and DL alpha-lipoic acid supplementation. Nutr Res. 1995;15(1):59-70. Sola S et al. Irbesartan and lipoic acid improve endothelial function and reduce markers of inflammation in the metabolic syndrome: results of the Irbesartan and Lipoic Acid in Endothelial Dysfunction (ISLAND) study. Circulation. 2005;111:343-348. McMackin CJ et al. Effect of combined treatment with alpha-lipoic acid and acetyl-L-carnitine on vascular function and blood pressure in patients with coronary artery disease. J Clin Hypertens (Greenwich) 2007;9:249-255. Wang X et al. Alpha-lipoic acid protects against myocardial ischemia/reperfusion injury via multiple target effects. Food Chem Toxicol. 2011;49:2750-57. Shi DY et al. Alpha-lipoic acid induces apoptosis in hepatoma cells via the PTEN/Akt pathway. FEBS Letters 2008;582:1667-1671. Dozio E et al. The natural antioxidant alpha-lipoic acid induces p27(Kip1)-dependent cell cycle arrest and apoptosis in MCF-7 human breast cancer cells. Eur J Pharmacol. 2010;641(1):29-34. Mantovani G et al. The impact of different antioxidant agents alone or in combination on reactive oxygen species, antioxidant enzymes and cytokines in a series of advanced cancer patients at different sites: correlation with disease progression. Free Radic. Res. 2003;37:213-223. Hagen TM et al. Feeding acetyl-L-carnitine and lipoic acid to old rats significantly improves metabolic function while decreasing oxidative stress. Proc Natl Acad Sci USA. 2002;99(4):1870- 5. Cho YS et al. alpha-Lipoic acid inhibits airway inflammation and hyperresponsiveness in a mouse model of asthma. J Allergy Clin Immunol. 2004;114(2):429-35. Femiano F et al. Burning Mouth Syndrome: open trial of psychotherapy alone, medication with alpha-lipoic acid (thioctic acid), and combination therapy. Med Oral. 2004;9(1):8-13. Femiano F et al. Burning mouth syndrome: the efficacy of lipoic acid on subgroups. J Eur Acad Dermatol Venereol. 2004;18(6):676-8. Lee EU et al. Alpha-lipoic acid suppresses the development of collagen-induced arthritis and protects against bone destruction in mice. Rheumatol Int. 2007;27:225-233. Kim HJ et al. Antioxidant alpha-lipoic acid inhibits osteoclast differentiation by reducing nuclear factor-kappa B DNA binding and prevents in vivo bone resorption induced by receptor activator of nuclear factor-kappa B ligand and tumor necrosis factor-alpha. Free Radic Biol Med. 2006;40(9):1483- 93. Magis D et al. A randomized double-blind placebo- controlled trial of thioctic acid in migraine prophylaxis. Headache. 2007;47(1):52-7. Stargrove MB et al. Herb, nutrient, and drug interactions. ClinicalImplications and therapeutic strategies. Mosby, Elsevier, 2008. Conlon BJ et al. Attenuation of aminoglycosideinduced cochlear damage with the metabolic antioxidant alpha-lipoic acid. Hear Res. 1999;128(1-2):40-4. Gedlicka C et al. Amelioration of docetaxel/ cisplatin induced polyneuropathy by alphalipoic acid. Ann Oncol. 2003;14(2):339-40. Kim E et al. A preliminary investigation of alfa-lipoic acid treatment of antipsychotic drug-induced weight gain in patients with schizophrenia. J Clin Psychopharmacol. 2008;28(2):138- 46. Martins VD et al. Alpha-lipoic acid modifies oxidative stress parameters in sickle cell trait subjects and sickle cell patients. Clin Nutr. 2009;28:192-197. Cremer DR et al. Safety evaluation of alpha-lipoic acid (ALA). Regul Toxicol Pharmacol. 2006;46(1):29-41. Gonzalez-Perez O et al. Therapeutic perspectives on the combination of alpha-lipoic acid and vitamin E. Nutr Res. 2006;26:1-5. Marsh SA et al. Vitamin E and alpha-lipoic acid supplementation increase bleeding tendency via an intrinsic coagulation pathway. Clin Appl Thromb Hemost. 2006;12(2):169-173. Park KG et al. Alpha-lipoic acid decreases hepatic lipogenesis through adenosine monophosphate- activated protein kinase (AMPK)- dependent and AMPK-independent pathways. Hepatology. 2008;48(5):1477-86. Basu PP et al. M1733 A randomised open label clinical trial with oral alpha lipoic acid and vitamin E in non alcoholic fatty liver disease. Gastroenterol. 2009;136(5 Suppl 1):A-420.